In 2011, we published a photo of an until then unknown Focke Wulf Fw 190 D-13 that was found at Gardelegen airfield. The aircraft was in poor condition and most of its fuselage burnt (see photo no. 46 on page 37 of our ‘Captured Eagles Vol. I’). [a] Still the features allowed it to be identified as a rare Fw 190 D-13. Only two other Fw 190 D-13s are known from photographs: W.Nr. 836016 marked ‘<<‘ of an unknown unit and W.Nr. 836017 marked ‘-+-10’ of Stab JG 26. Both W.Nr. 836016 and W.Nr. 836017 wore their W.Nr. at the tip of the vertical tail plane. Since we published our photo in 2011, another photo of the same Fw 190 D-13 wreck has been discovered (see photo above). Interestingly, the aircraft’s W.Nr. is at a different location just above the elevator, but unfortunately, the number is not readable. Fw 190 D-9 W.Nr. 401381, which was also built by the same manufacturer that also built the few Fw 190 D-13 (i.e. Arbeitsgemeinschaft Weserflug (Arb. Roland)), featured the same position of the W.Nr. 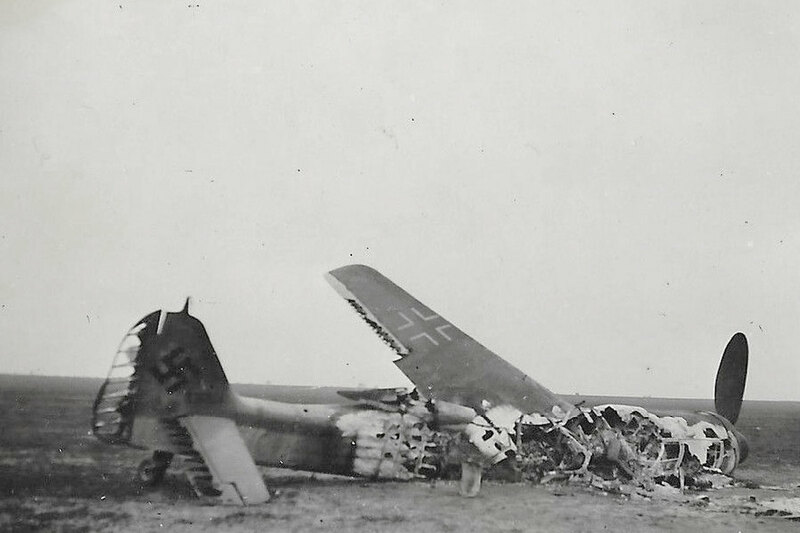 and a very similar camouflage scheme of the rear fuselage like this Fw 190 D-13 wreck. [c] W.Nr. 401381 may provide a good indication of how this Fw 190 D-13 had looked like when it was still intact. Note the port aileron that appears to have a lighter color than the rest of the wing.